5 ‘And when you pray, do not be like the hypocrites, for they love to pray standing in the synagogues and on the street corners to be seen by others. Truly I tell you, they have received their reward in full. 6 But when you pray, go into your room, close the door and pray to your Father, who is unseen. Then your Father, who sees what is done in secret, will reward you. 7 And when you pray, do not keep on babbling like pagans, for they think they will be heard because of their many words. 8 Do not be like them, for your Father knows what you need before you ask him. The Lord’s Prayer by navalatanjjnn, and made available under this licence. Here in the UK we’re just weeks away from a General Election, when we get the opportunity to vote on who would like to represent us in the House of Commons. I would say that we’re ‘gripped by election fever’, but actually, the truth is that I have seen little to suggest that this is the case. What I have seen is politicians of all parties laying out their plans and policies that they will seek to implement should they be elected on May 7th. There has been a little mud slinging, but so far the politicians seem to be generally behaving quite well. It is almost inevitable, though, that at some point at least some politicians will be branded as hypocrites – saying one thing whilst doing another. It might be retaining staff on zero hours contracts whilst railing against this kind of employment. It might be sending their children to independent schools whilst advocating equality. It might be fiddling their own expenses whilst condemning the wealthy for using tax avoidance strategies. If they are to avoid such criticism, our politicians must lead lives that are whiter than white and live by the rules that they seek to apply to the rest of us. If they fail to do so then it is inevitable that they will be criticised for being hypocrites. In today’s passage from the Sermon on the Mount, Jesus warns against hypocrisy when praying. He urges his followers, ‘when you pray, do not be like the hypocrites, for they love to pray … to be seen by others’. There were some contemporaries of Jesus who took great pride in their own supposed piety. They were keen to be seen as diligent and ardent prayers. They wanted others to look at them in awe, to think that they were godly, spiritual and devoted to a higher cause. For them, prayer was a very public affair. How else would they gain the admiration of others? Jesus is very critical of such people; their hearts are not in their prayer, their motivation is wrong; they are hypocrites. They do not pray to get closer to God but to gain the respect of others. They, however, have already received their reward in full. God listens to them but their prayers will go unanswered. Genuine prayer is between God and the prayer; there is no need for any additional audience. Personal prayer is just that – a private moment, an opportunity for an individual to reflect, to share their concerns with God, and to listen to him in a moment of peace, calm and tranquility. This is why Jesus tells his followers that when they pray, they should ‘go into your room, close the door and pray to your Father, who is unseen’. This is genuine, heart felt prayer; not some religious act to gain credibility from others, but a two way process based on love, expressing love for God by talking to him in recognition that his love for us means that he listens and responds to our prayers. Jesus then gives an example of a prayer which provides a structure that we should use to guide our prayer. Now known as the Lord’s Prayer, it provides a useful pattern on which we should base our own prayer. It begins with an expression of adoration for God, recognising him as our Father before glorifying his name. Next it shows that we should pray that God would help us to align our desires with his plan, namely asking that he will equip us to play our part in bringing about his kingdom whilst following his will for our lives. Jesus then suggests that we ask God to provide us with all that we need to live, before turning to the difficult issue of sin. Jesus suggests that we ask God to forgive us our wrong doings, whilst also affirming before God that we have forgiven those who have wronged us (perhaps the hardest element of the prayer). Finally, Jesus tells us that we should ask God to help us to avoid temptation whilst also asking him to rescue us from sin and the devil. 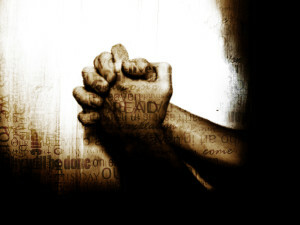 Prayer is something with which many Christians struggle – myself included. If this is you, why not find a quiet room today and shut yourself away, free from distractions, just for a few minutes, and lift your thoughts to our father in heaven. If you get stuck, why not simply recite the Lord’s prayer and then reflect, in a moment of stillness, on God’s majesty and his love, which he demonstrated so significantly by sending his son to die for us.